Mabul is famous for its amazing macro and muck diving and is the nearest island to Sipadan island. Stay at Mabul island and experience the amazing marine life of Sipadan, Mabul and Kapalai. The oval-shaped Mabul Island is home to various marine species that will surely captivate a diver’s heart. Mabul is definitely one of the richest single destinations for exotic small marine life anywhere in the world. Mabul Island is merely a fifteen minute boat trip away from Sipadan Island and also, similar to Kapalai, is renowned for its macro diving mecca and it known as one of the greatest 'muck diving' locations around the world. 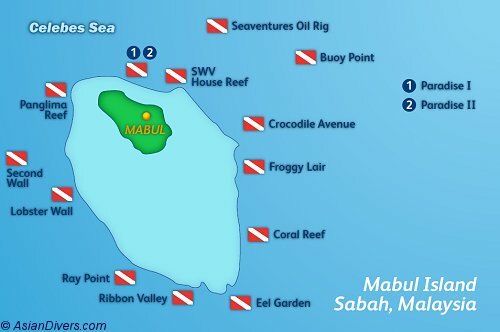 Mabul is actually a small, oval island covered with sandy seashores and also located on the north western side of a much larger reef. Flamboyant Cuttlefish, Wonderpus, Coconut Octopus and Bobtail Squid are only a couple of the several varieties of Cephalopoda that can be found around Mabul. Various types of gobies are seen which includes the Spike fin, Black Sail-fin, and Metallic Shrimp Goby. Hairy Frogfish are all over the place and also various species of frofishes such as the Clown Frogfish are frequently spotted. Moray Eels and Ribbon Eels of several species can be found, together with more or less the entire lionfish family. It will likely be a lot quicker to list the few species not available at Mabul as amazing muck diving happens to be in abundance around these marvelous dive sites.